Agripak International is the company that offers a wide choice of Agricultural Machinery to meet the Farming Machinery requirements of every low & medium sized income Farmers Community. Whether you are a Farmer or a Dealer, you will find the best quality and Cost Effective Equipment to satisfy your needs. We offer also the Complete Solution starts from Soil Preparation to Seed Drilling Equipments, Spraying, Fertilizer, Reaping and Threshing to Haulage Equipments. 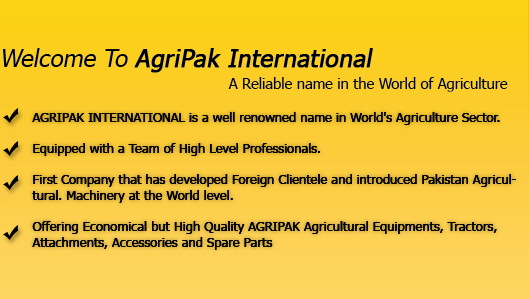 The AGRIPAK is renowned the Best Source for Pakistan Tractors & New Holland Tractors, FIAT Tractor John Deere Tractors. We closely work with our partners and give complete focus to your particular demands regardless with quantity requirements. The AGRIPAK Trademark is also renowned for its Best Source Spare Parts. We have in-line problem solution system to suits your timely problem rectification with in 24hrs, and right after, the Parts Needed to be shipped timely. We arenot a manufacture and authorized dealers of MF Tractors. Infact, we have a huge and large stocks available of Quality MF Tractors all the time for ready shipments as comparable with other suppliers.